We’re all aware that the economy has a rhythm or cycle and is also referred to as a business cycle. When the cycle is on an upward trajectory people’s financial situation is improving and as the cycle turns downward their financial situation can deteriorate. The U.S. is experiencing the second longest economic expansion in post war history. The odds of the cycle turning downward are increasing every month. How do you improve your condo and HOA’s collection practices before the next recession? 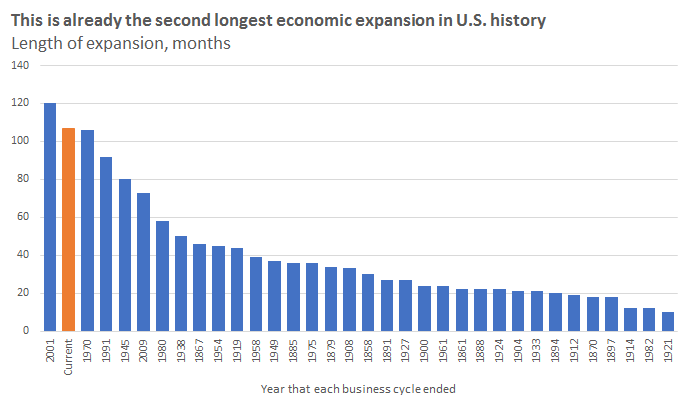 This chart below is from 2018 and now in February 2019 we are only 4 months away from becoming the longest economic expansion in history. If you listen for it you will start to hear professional investors and economists starting to say the “R” word again (Recession) and predictions between later this year or during 2020. During the last few years of this economic recovery most communities have experienced “good times” with few problems with delinquent payers. However, when we start to experience a recession your board may experience the “bad times”. It may not be like the Great Recession but the next economic downturn can still be impactful. A larger percentage of late paying or delinquent owners can have a serious impact on a community’s budget. Cash strapped communities may accrue fines or late fees for paying bills late, vendors may not show up to provide service since they are not being paid in a timely way, other services can be interrupted and amenities could be shut down due lack of operating funds. The Board your community has today is likely not the Board that went thru the “Great Recession”. So when your community experiences a sudden increase in delinquencies what is the Board going to do? Make it Easy for Owners to Pay: The best way to make paying your dues / common charges easy to pay is to give owners more ways to pay. Let people pay by check, let people pay by bank draft (ACH), let owners pay by credit card (they pay the transaction fee), let people mail in payments, pay online, and you can even take payments by phone. The one caveat to this is cash, we recommend you do not accept cash as it can go missing too easily. Adopt or Update Your Collection Policy: A collection policy will outline what steps your community takes when an owner pays late, if you don’t have one you need one in many states to ensure you are able to take legal action on late payers. Get professional advice. You can use a credentialed, licensed manager to review and help you with collection policy best practices (we have a few that can help you). After you’ve incorporated these changes you’ll want your attorney to review it. When using an attorney, make sure your community uses one that specializes in community association law and is not a generalist, it will take you longer and cost you more. When completed, send this out to all owners so they are aware of what the policy is and what will happen if they pay late. Remember, the money spent to properly write up a collection policy is an investment. Communication Protocol: Can you quickly mail communications to owners on what they owe? If you don’t already maybe you want to change to mailed statements showing updated balances and late fees. Make sure you have the ability to mail out Late Letters as friendly reminders and that you can send out Pre-Lien Letters by certified return receipt mail. Communication systems will work lockstep with the collection policy you adopted. Increase Late Fees: If you are not charging late fees you need to. The late fee should be a meaningful penalty. If it’s not it’s a joke and you are last on the list of bills to pay. You may be able to just increase the late fees in your rules and regulations, however, check your governing documents some may have a stated late fee that you may have to revise. I’ve seen documents from the 1970’s and early 1980s and the late fee is $10 or $15. If you adjust that for inflation you are going to have a better deterrent. Lastly, remember your community needs to be able to uniformly apply the late fee to every owner and record it in your accounting system. Add a Meaningful Penalty: If late fees are not producing the desired outcome you have an option. Lower the delinquent payer’s credit score every month and they will start to pay attention to your bill. This method works that is why large corporations report to the credit agencies for credit cards, car loans, mortgages, etc. The association can add this with the help of a credit agency approved Financial Management Company like Community Financials. Find a Condo /HOA Collection Company or Collection Attorney: If you don’t currently work with a collection agency or collection attorney you will want to line one up. Additionally if you are not satisfied with the agency or attorney you currently use now is the time to investigate alternatives. We recommend you search for candidates through your local Community Association Institute (CAI) chapter. Vendors that are part of CAI are specialists that will know not only about collection law but also condo and HOA specific laws. Here is a link to find a chapter near you. If you take these 6 steps to improve your condo and HOA’s collection practices before the next recession you will fare better than the community down the street. I know most community boards are usually kept busy reacting to issues that come up. However, we recommend getting ahead of this issue as it will save your Board time and problems down the road. If your Board doesn’t have time form a committee to assist you. Community Financials is also here to help. If you want to discuss these 6 Steps please schedule a call with us.